By the order of the Ministry of Regional Development and Infrastructure of Georgia, road and coastline upgrading, widening, protection and strengthening works are underway at 117km-119 km section of Senaki-Poti-Sarpi international road. Senaki-Poti-Sarpi road is international highway and average daily traffic intensity on this road is 15 000 vehicles. Before commencement of rehabilitation works, lower slope of the road was scoured due to storm waves that exposed to danger road stability, transport and passengers. Also, the serious problem was 932 m long road section, whereon stones falling from the steep rocky slope have damaged vehicles and cargo. Rehabilitation of 110 m overpass is competed under the project; rock fall protection net is arranged. 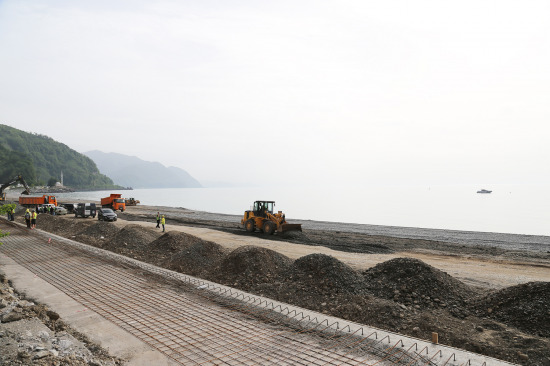 After completion of rehabilitation works, the carriageway will be widened by 5 meters, the coastline will be expanded and 7.71 meters high stone berm will be constructed to protect the territory during the storm. The chairman of Roads Department George Seturidze and representatives of State Construction Company observed road and coastline upgrading, widening, protection and strengthening works at km 117-119 of Senaki-Poti-Sarpi road. Construction and rehabilitation works shall be finished within the current year. Bank protection works are financed from the state budget and the cost is GEL 5 840 000. Overall 100 people are employed on these works, from which the majorities are local residents.